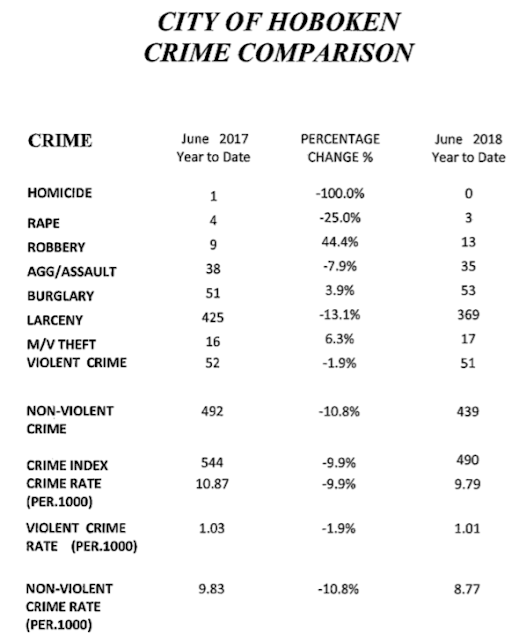 The Hoboken Police Department announced its mid-year report on crime and with it announced a 10% drop in crime year to year but the figure that leaps out is the remarkable closure rate. It's not the only astounding fact revealed in the report. Hoboken Police Chief Ken Ferrante notes in the release the HPD has closed after arrest fully 219 of 671 reported crimes. That's an eye-popping 32.6% closure rate. The release heralded the closure rate where the Hoboken Police Department exceeds the state averages in fully six of seven areas. The most important among them: tripling the state arrest rates in robberies and burglaries. With Hoboken's increased visibility as a successful town, the Mile Square City is a prime target for thieves and gangs looking to operate where scores are plentiful. It's been a decades-long problem as Hoboken's housing stock continues to increase in value making its residents prime targets. HPD Police Chief Ken Ferrante saluted the department for these milestones stating, "I thank and commend our Uniformed, Investigative and Training Bureaus, and those bureaus' commanders, supervisors, detectives, patrol officers, and civilian staffs!" Talking Ed Note: Both the closure rate and whopping increase in arrests for robbery and burglary reveals a laser-like focus on implementing better policing strategies with improved outcomes. Under the leadership of HPD Chief Ken Ferrante, the public safety policing performance is being felt at all levels and is reflected in the pride of policing by its members to the benefit of all Hoboken. A big hat tip to all the fine men and women serving in the HPD with a hearty thanks to one and all. Well done!